This is our lightest electric bike weighing only 19.9kg with the battery. It is very easy to handle and lift should you need to. The Striker is ergonomically designed so it rides beautifully. A very fun ebike and a real head turner in stunning matt red. The Roodog Striker Electric Bike is our lightest electric bike weighing only 19.9kg with the battery. Made from aluminium alloy 6061, it is both light and robust to handle rugged mountain terrain. The Striker eMTB is ergonomically designed so it rides beautifully. A very fun ebike and a real head turner in stunning matt red. 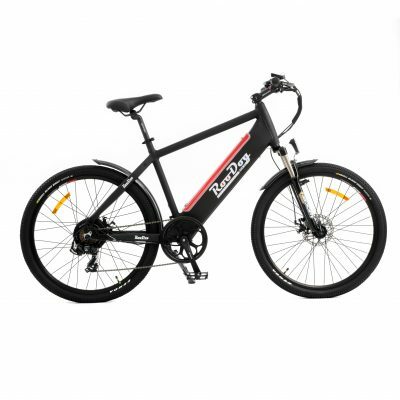 The 250watt motor will assist you up to 15.5mph (the maximum speed allowed by UK/EU regulation) and is powered by a 36 volt 10Ah lithium-ion battery. This gives a range of up to 30 miles* per full charge. Batteries can be charged on the bike or unlocked and removed and will take four – six hours to charge from flat. The LCD display shows the battery indicator, management of 5 speeds, and LED lights for the front, the back light is solar powered. The Shimano 7 speed Megarange gears mean you won’t have any problems taking on those hills. Use the gears in conjunction with the five modes of pedal assistance and you will have great fun. Aluminium alloy double walled wheel rims and 26” X 1.95” Kenda mountain bike make riding trails fun and easy. Aluminium alloy Zoom suspension and tektro disc brakes front and rear, make the Striker a very high quality, good value bicycle. *This will vary depending on weight of cyclist, frequent use of pedal assist, air pressure in tyres, road condition, etc. The Striker has been my constant companion this year. Together we have ventured forth most days. I live on the Isle of Wight. Lots of steep hills. The Striker has simply eaten them up. I reckon I can get, with pedalling myself, about 40 miles to the charge. My aim is to ride round the IOW next year. I have arthritis and thought my cycling days were over. Not a bit. The Striker has enabled me to get some exercise and to get fitter while having fun. And the Customer Service from Espokes has been fabulous. Nothing has been too much trouble – from the initial test ride, to the collection of the bikes (my husband got one too), the first service and regular contact. I have dealt with many companies selling electric bikes – Espokes are the best by far. After having a chat at the E-spokes stand at a Newbury show, and a short ride around the show-ground, I just had to have one. Liking the look and specification of the Striker, I followed it up with a test ride, and purchase, at E-spokes. The staff were very helpful and bike has faultlessly lived up to all expectations. I have Parkinson’s and the bike enables me to get some exercise while having the reassurance the battery will help me home if need be. After thinking about buying an ebike for some time I visited and made a purchase on a Monday, I received my new Striker Wednesday, built, checked and charged ready to go. took my first ride from the shop to home (4 miles) an easy 17 minutes of riding pleasure. excellent customer service and very friendly and knowledgeable staff. Highly Recommend! Thank you Laura & the Team. A great bike backed up by very helpful staff. I’m a 75+ year old OAP and until I purchased the Striker just over a year ago, flat terrain (and no headwind) were the only conditions for me to consider cycling. Over the years, I’ve always enjoyed riding off road as well and this tough, lightweight frame, multi-use tyres and with the epower backup have enabled me to enjoy what I used to do. It’s a great bike for distance on road riding and real fun when you venture off road. Hills and muddy tracks are most enjoyable to ride – this is a fun, versatile and cost effective bike to ride!